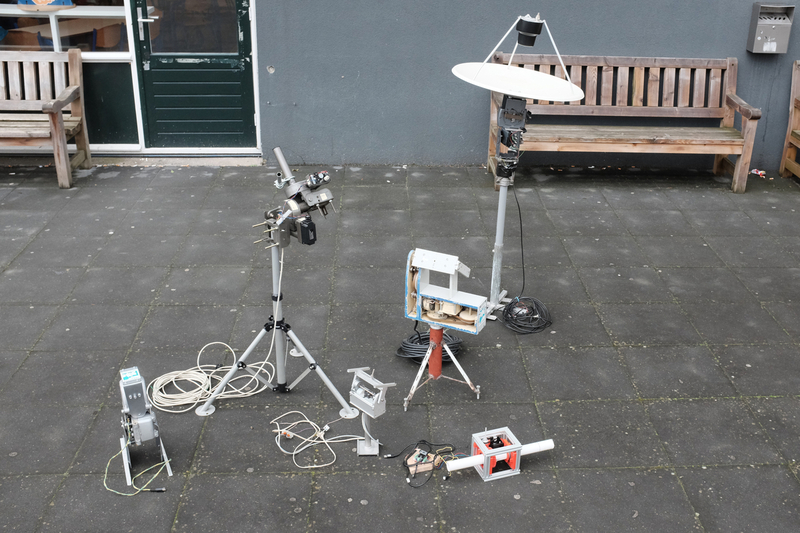 The Spacekeet, a project by Roel Roscam Abbing, will be able to track satellites as they fly across the sky. One of the parts required for this is a large dish. The main dish will be a do-it-yourself 120cm wire dish. It is based on a design by the Werkgroep Kunstmanen and drawn by Harry Arends. That design uses an F/D ratio of 0.5, the one Roel Roscam Abbing has been building has a ratio of 0.6, which leads to better magnification. Within the werkgroep there is a lot of discussion on the best way to build (and control) dish rotors. During the last meeting of the werkgroep kunstmanen the members brought along their dish rotors to have a diversity of approaches to discuss and show. From the fully self-built designs, to designs which are clever hacks based on commercial products to more modern 3d-printed designs. The design and building of the rotors is relatively involved, especially for the members who are not inclined to spend hours in a workshop (or that don’t have a workshop). Currently there is no ‘recommended design’, it is all relative to the amount of skills/time/money/patience one has. An X/Y Rotor can be constructed by using two commercially available rotors and mounting one on the axis of the other. A downside every X/Y motor has is that one motor will carry the weight of both. Additionally it is difficult or impossible to install a counter-weight for the dish itself which requires additional carrying capacity for your motors. The advantage of an X/Y model over an Az/El design is that it can track any point in the sky in a single fluid motion. An Az/El design is limited by the requirement that at some point it crosses through its origin, meaning the whole system needs to be flipped to track something from horizon to horizon. This could lead to losing track of your signal in the mean time.